The textile art of Moriguchi Kunihiko demonstrates the powerful and creative energy that can be found in the best of Japanese art crafts (Kôgei). In addition to being a master yûzen textile artist, Moriguchi Kunihiko (b. 1941) is a visionary who can see the future through the past and find the way forward. His artwork is unique, carefully designed and constructed and yet can be functional and certainly life enhancing. He has worked for over four decades to find a dynamic interface between high level art crafts he practises and consumer taste. 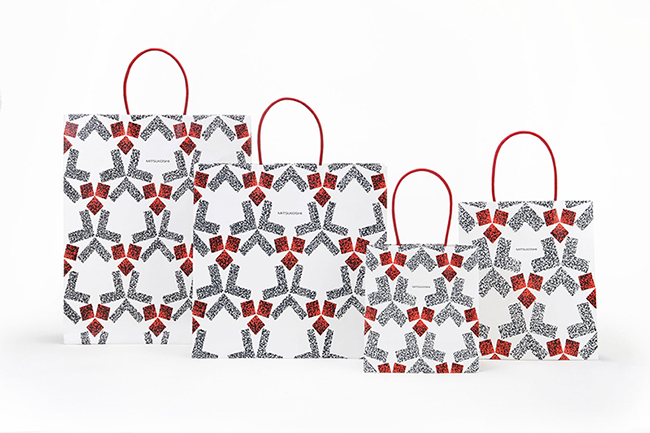 This latest collaboration with the Mitsukoshi Department Store can be seen as a brilliant move in fulfilling this desire to bring art into the realm of daily life. And it is typical of Mitsukoshi Department Store to choose to work with Kunihiko in a challenging and new way that will help bring greater recognition for the art crafts through his designs. As a curator, I had my first chance to work with Kunihiko during the preparation to an exhibition I helped to create at the British Museum called Crafting Beauty in Modern Japan, Celebrating fifty years of the Japan traditional art crafts exhibition in 2007. Tim Clark, the head curator for Japan at the British Museum, and I visited an exhibition of Kunihiko’s kimono in Japan and then stopped by his home and studio. This unforgettable visit – for me an eye opening experience- spurred me on in creating the Crafting Beauty in Modern Japan. While of course I knew they were static, nevertheless Kunihiko’s kimono seemed to sway on their stands depending on where one stood. The carefully chosen colours were mesmerising and the patterns seemed to take on their own life with infinite possibilities. This sense of fluidity helped me to realise the potency of the kimono as a kinetic art form, whether worn or not. The beauty of the kimono was enhanced by Kunihiko’s design patterns that were based on a marriage of nature and geometry and seemed to undulate gently across the surface. Upon entering Kunihiko’s home in Kyoto, Tim and I realised how much his partnership with his wife Keiko had helped give him the strength to pursue his artistry while fulfilling his considerable duties as the top yûzen artist. In fact, Kunihiko’s work involves imagination, skill and will power in creating his innovative designs within a traditional art form in the conservative textile centre of Kyoto. To revolutionise without alienating a traditional art form requires nerves of steel. Doubtless with Keiko’s help, Kunihiko succeeded with grace throughout his career to innovate while respecting tradition. The British Museum was particularly grateful to follow his guidance for this exhibition thus avoiding what might have been irrelevant and showing only the best of Japan’s arts crafts traditions. The Crafting Beauty in Modern Japan exhibition was an exciting challenge for the British Museum, not only because it was the first exhibition of its kind there, but also on account of the range of material to be displayed. The exhibition celebrated 50 years of the Japan Traditional Art Crafts exhibitions, which from the beginning was in part sponsored by the Mitsukoshi Department Store. Objects to be shown at the British Museum were all displayed previously at some point in one of the yearly exhibitions held at Mitsukoshi Department Store and ranged in material from ceramics, textiles, lacquer, metal, bamboo to wood, dolls, objects decorated with cut metal foil and glass. The then Head Curator from the Crafts Gallery of the Tokyo National Museum of Modern Art, Kaneko Kenji, and Kunhiko made a formidable duo that managed to help us overcome any cultural barriers. 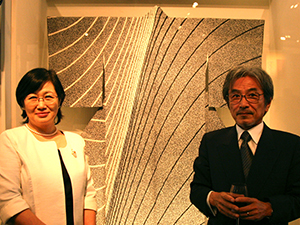 Kunihiko attended numerous meetings in Japan to help with the concept and design of the London exhibition to ensure that it reflected the reality of Japanese art crafts. This was certainly not an easy task. What is understood as a given in Japan is not necessarily apparent in the West, and certainly not among the uninitiated. The British Museum soon came upon interesting hurdles in trying to bring an authentic expression of Japanese art crafts to Britain that could be easily understood by the general public in Europe. The title for the exhibition is one example of the different connotations in terminology. The Japanese title for the exhibition was Waza no bi, dentô kôgei no 50 nen or 50 years of the Beauty of Traditional Japanese Crafts. The British Museum carried out a survey in advance of naming in English the exhibition and found that the word ‘craft’ mostly meant handmade to the British audience, conveying mostly an amateur pursuit. The term ‘Japanese craft’ brought up concepts of simple or delicate design as well as images of origami or flower arranging, Male respondents often envisioned military or samurai based crafts with this term. The term ‘tradition’ was also seen as staid and based on the past. However, the term ‘modern’ was seen as positive and attractive to younger audiences. Not using the words ‘tradition’, ‘traditional’ or ‘craft’ in the title proved to be a challenge. Finally, Dr. Rupert Faulkner, a senior curator at the Victoria and Albert Museum and a specialist on Japanese three-dimensional expression, came up with a new formulation that fit with the spirit of the exhibition, ‘Crafting Beauty in Modern Japan’. By turning the noun ‘craft’ into a verb ‘crafting’, Rupert had also helped to address another terminological challenge, namely that of the importance of waza meaning ‘skill’ or ‘process’. For Japanese traditional art crafts the sum of the process through skill is the result, or in other words the result is only possible because a careful and thought out process has been followed. The cumulative process for Kunihiko ensures that the wondrous kimono that results is never left to chance but always a result of skillful planning of the artist working in careful harmony with the materials, be it water, silk, dye or paste. In the Crafting Beauty exhibition, Kunihiko helped in part with the selection of the objects and their placement in the galleries. Ideas around the display of textiles proved to be another challenge as in England it is the front of the textile that is most often celebrated. 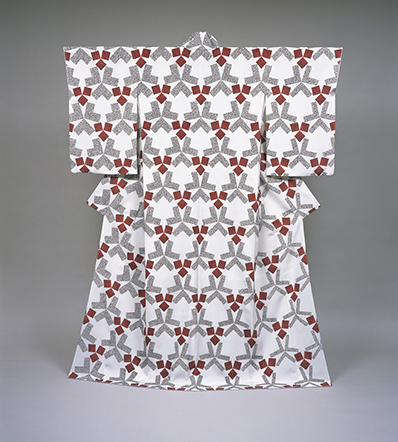 The British Museum designers accordingly wanted to show the front of the textiles, whereas Japanese tradition stipulates that it is the back that is displayed to great effect. A compromise was reached where most of the textiles were shown in the proper Japanese fashion and two special cases were created to show two examples in the round. These cases proved particularly popular with the public as they could see before them the thinness of the fabric and the actual construction of the work. At the entrance of the Crafting Beauty exhibition, five works, each from a specific craft idiom were chosen as key objects with a view to orient the audience for the rest of the exhibit. The chosen textile work was a spectacular kimono by Moriguchi Kakô (1909- 2008) entitled ‘kimono with chrysanthemum-petal’ made in 1960 from the collection of the National Museum of Modern Art, Tokyo. Kakô, Kunihiko’s father, is an exceptional man and was made a Living National Treasure in 1967 for his yûzen technique. Inside the exhibit, Kunihiko’s elegant kimono entitled ‘sand flow’ was exhibited alongside a large photographic image of the same kimono being worn while the model was walking, so that the kimono could be seen in motion as it was meant to be viewed. This display helped the visitors realise that Kunihiko’s designs were fundamentally about fluidity, geometry with nature and harmony with motion. In 2007 just before the opening of the exhibition, Kuniko was designated a holder of an intangible cultural property or Living National Treasure for his yûzen technique. For a short period of time both he and his father were designated Living National Treasures together, a first for the Agency of Cultural Affairs. The exhibition chartered new territory for the British Museum with the display of Japanese contemporary art craft works of the highest quality. As a result of the exhibition the British Museum currently collects superior examples of Japanese art crafts, which are regularly on display in the Mitsubishi Corporation Japanese Galleries. Indeed one central case in Room 94 of the Japanese Galleries is called Crafting Beauty in tribute to the 2007 exhibition. In Japan most people have some knowledge of Japanese traditional textiles, specifically how they are made and how they are to be worn. The West has tended to view the kimono as an object of fascination but in a looser sartorial context. The Dutch first brought kimono back at the start of the Dutch East India trade with Japan in the 1630s. Then as we see from European portraits, kimono were most often used as an over garment to be worn by men. Somewhat later, the kimono enjoyed a popular comeback in the West from Paris to New York City, this time as a fashion statement for women in the mid to late 19th century reflecting the current fashion for all things Japanese. For example James Abbot McNeill Whistler’s painting of 1863-4, La Princesse du Pay de la Porcelaine currently in the Freer Gallery of Art, Smithsonian Institution, Washington D.C. comes to mind. The evocative oil painting depicts a Japanese kimono loosely tied with a sash and an uchikake outer robe falling off the shoulders of a stunning western woman who holds an uchiwa fan and stands in front of a painted folding screen on top of a Chinese woven rug. The overall image of the painting is one of luxurious patterns, saturation of colours and rich textures. Whistler certainly had Japanese textiles at hand when he was painting but they in themselves are only props in his composition, which was centred on the exotic pastiche of foreign delights. The kimono depicted in Whistler’s painting is reduced to an elegant backdrop. The strict etiquette of the kimono, its ritual layering, its intricate designs, its aesthetic criteria and its visual power are still not properly understood in Europe and North America, although Museums such as the Metropolitan Museum of New York, the Los Angeles County Museum of Art and the Victoria and Albert Museum in London have important collection of Japanese textiles and have each created informative exhibitions featuring Japanese textiles. In Japan as well there could also be the danger that the kimono as traditionally worn might be relegated to being an artefact of a past age. However, through the combined efforts of the Japan （トルツメTraditional） Art Crafts Association, various curators, textile designers and kimono wearers, the kimono appears to be making somewhat of a comeback in Japan. However, life styles and living patterns have changed. For the kimono to survive in the 21st century onwards it needs to adapt to new life-ways and international currents. Kunihiko and his father understood the kimono and its patterns needed to embrace the evolving aesthetic of the 20th and now 21st century woman. His father and then Kunihiko set about modernising the patterns and the style of their kimono while never compromising on technique or materials. 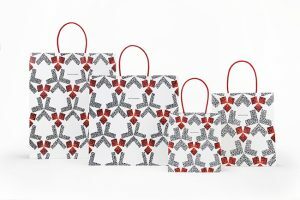 The power of Kakô’s and Kuniko’s designs is best understood with a basic knowledge of Japanese textile traditions, history and techniques. Textiles fall into two categories in Japan according to their basic techniques, which are either dyeing or weaving, although these techniques are sometimes combined. Textile influences on Japan come from China, Korea and other Asian countries as well as the West. During the Edo period (1603-1868) the kosode, or robe with small sleeve openings, was developed, a forerunner for what is now the modern kimono. The forerunner of the Mitsukoshi Department Store (then under the name of Echigoya) itself started in 1673 selling kosode and textiles to patrons in Edo and later in other areas of Japan. Many new styles soon emerged, catering both to the samurai and to merchant classes. Complex textile techniques also soon debuted in the Edo period that featured vivid colour combinations of painted, as well as woven and embroidered designs created with the wearer’s movements in mind.However, Perhaps the most celebrated development in Edo period textile design was the creation of the yûzen technique. The original technique involves painting directly onto prepared fabric with rice-paste resist and then dyeing the fabric in various colours. The paste-resist is applied free hand and demands artistic skill from the textile artist. This yûzen technique was said to be developed by and was subsequently named after the Kyoto based fan painter Miyazaki Yûzensai, who first perfected the method in the late 17th century during the Genroku period, 1688-1704. The new type of dyeing included bold colours and even bolder designs eventually transforming the more staid period textile design by overcoming earlier limitations. With the advent of the yûzen technique, textile designs were thus brought closer to painting designs and often were therefore influenced by popular artists and motifs. Patterns were drawn onto the textile, often silk, with a dye resist rice paste that was placed in a cloth or paper bag with a metal nozzle in a variety of techniques such as itome (thread like lines), sekidashi, musen and fuki. Stencils were also laterally used in yûzen painting. A variety of techniques were often combined with the paste resist painting such as embroidery, ribbed metal foil (surihaku), hand stitching and tie-dye. Yûzen textiles originated in Kyoto where the waters of the Kamo River were used to wash the textiles during the laborious process of yûzen dyeing. The technique soon became popular and was produced in the Kaga domain (Kaga yûzen) current day Ishikawa Prefecture, and then later in Edo (Edo Yûzen). But Kyoto still remained the spiritual home for yûzen dyeing and retains its mantle to the present day. Moriguchi Kakô was born in Moriyama City, Shiga Prefecture in 1909. He travelled to Kyoto as a youth in order to study pharmacy but instead became apprenticed to the master yûzen artist Nakagawa Kason III (1882-1967). Through Kason’s introduction Kakô also studied Nihonga, or Japanese style painting, with the Shijô artist Hikita Hôshô. While studying with Hôshô, he received the name Kakô. He completed his training with Kason in 1939 and became an independent yûzen artist. It was just at this point that he viewed a historical yûzen kimono with the makinori or sprinkled resist paste technique at the Tokyo National Museum what would become a seminal part of his and his son’s artistic repertoire. This experience inspired Kakô to study the technique, which he refined and made his own. Similar in a fashion to maki-e or sprinkled gold in Japanese urushi or lacquer, Kakô would sprinkle rice paste over the damp silk to act as a resist prior to and in-between applications of colour. The makinori technique gives a textured and more nuanced appearance to the colour dyed designs. He submitted a yûzen textile with the makinori technique for the Japan traditional art crafts exhibition of 1955. The kimono was not only accepted, it was awarded the prestigious Asahi Shimbun prize. Twelve years later in 1967 he was designated a Living National treasure for his yûzen technique. Subsequently, the makinori technique as originated with Kakô and developed further by Kunihiko became the signature Moriguchi style. Moriguchi Kunihiko was born in Kyoto and received a degree in Nihonga, Japanese style painting, from Kyoto City University of the Arts in 1963. He then went to Paris as the first Japanese national to receive a French government scholarship to study in France. In Paris at the École des Arts Décoratifs he studied architecture and graphic design, graduating with honour in 1966. During his time in France Kunihiko became close to several artists who had a profound influence on his future career path. Perhaps most important to Kunihiko’s future direction was the artist Balthus (1908-2001), who became a mentor to Kunihiko. Balthus questioned Kunihiko as to why he did not go back to Japan and work with his father. Taking up the challenge Kunihiko returned to Kyoto and apprenticed with his father. He submitted his first textile to the Japan Traditional Art Crafts Exhibition the next year in 1967 and it was accepted. From this start in 1967, Kunihiko’s designs celebrated all that he had incorporated during his studies abroad as well as his intrinsic love of nature, geometry and movement. Like his father, Kunihiko is inspired by the natural world. His father’s yûzen textile designs were often the result of his sketches from nature and the development of a single motif derived from the world around him, be it animal, nature or water. Because of his excellent artistic skill the design encompassed the entire kimono, taking full advantage of the entire silk cloth as a single picture frame. The images Kakô designed were never static. The designs would wrap around the wearer transforming garment and wearer into part of the play of pictorial motifs that danced around the body. Kunihiko took his father’s genius a step further in a fresh and modern fashion. While still inspired by natural motifs, Kunihiko’s influences are more elemental. He based many of his designs on abstractions from nature, mathematically determined transformations that were carefully worked out but that flowed and evolved, transforming colour into movement. Rupert Faulkner has pointed out that Kunihiko’s strength lies in part in his tonal grading, something not achieved to such great effect by any other textile artist. His topology series, which he created for the Japan Traditional Art Crafts exhibitions from 2009-2013, are floral geometric patterns, which are mesmerizing. They appear to move and no pattern stays the same while the overall effect is gentle and calming. Each of his kimono can take between six to eight weeks of intense work to complete making it a work of art in and of itself. Kunihiko’s textiles are designed so that they can be worn as well as looking equally compelling on a traditional kimono rack or ikô. The brilliance of Kunihiko’s design is that it is completely modern and fresh and yet fits within the trajectory of Japan’s rich history of traditional art crafts. The challenge Kunihiko is tacking with at the moment is the very future of his art and that of the field as well. With limited space in contemporary living quarters and restricted use of the kimono as fashion, the future could appear bleak. Kunihiko understands that the traditional art crafts artists need to reach out to new audiences and to revive their traditions much as Miyazaki Yûzansai did in the Genroku period and his father did in the post war era. In thinking through the future Kunihiko has been experimenting with ideas at present. In an exhibition that was held in the autumn of 2013 in London called Four Living National Art Treasures held at the august institution, the Fine Art Society, Moriguchi debuted his new makinori white and black geometric designs on silk squares called the Big Bang series. As an innovation he has created yûzen contemporary art in a form that can be accommodated in contemporary living spaces. The impact of his art in yûzen is encapsulated on these silk squares that are separate from his kimono and that can either stand-alone or be seen in series. They are nothing if not revolutionary and I feel with his new creation he has allowed for alternative possibilities and imaginative futures for his field and for his own artistic production. the Mitsukoshi Department Store brings with it the possibility of infused new energy into a traditional art form.